by Fleur Johns. Cambridge, UK. : Cambridge University Press, 2013. 259pp. $99.00 cloth. ISBN 9781107014015. Reviewed by Christopher P. Banks, Department of Political Science, Kent State University. Email: cbanks6 [at] kent.edu. Fleur Johns’ NON-LEGALITY IN INTERNATIONAL LAW is an intriguing and ambitious critique of the way in which international law scholars and practitioners are constrained to understand the effect that non-legality has in generating new, normative conceptions of international law. From her perspective “non-legality” consists of what could be interpreted as heuristic devises that are often overlooked by the legal community whenever scholars or practitioners analyze and apply legal concepts to their work. These devises, which Johns labels as “illegality”, “extra-legal”, “pre-and post-legal”, “supra-legal”, and “infra-legal”, are placed into the context of case studies addressing a diverse range of topics, ranging from the release of the infamous “torture memos” by G.W. Bush administration lawyers, to counter-terrorist detention management, transnational cross-border financing deals, global climate change policy, and the international legal orientation on the management of dead bodies in the wake of natural disasters. By drawing attention to these devises and case studies, the book is both a reminder and clarion call: it prompts action by exposing the weakness of prevailing scholarship that Johns suggests is too wedded to conventional thinking about international law and, in the process, it impels scholars to be more focused on appreciating the constitutive and cultural underpinnings to understanding international law, as applied by real-world practices, norms, management techniques. Johns refers to her efforts in this regard as “tactical engagements” (pp.26, 217). The first chapter outlines the plan of the book, explains the methodology, and presents the main arguments in broad terms. It introduces the non-legality concept by considering how the use of armed drones, in so-called targeted killings governed by international law, is delineated by Professor Philip Alston’s report to the United States Human Rights Council (p.2). The report, Johns argues, expresses concern about recent state drone strikes and practices, especially in grappling with the presumably democratic problem of making countries more accountable and transparent in using them and thus, more in line with established international rules. For a variety of reasons that Johns details, the legality of such strikes “depends on context, legally understood: that is, whether it was conducted in armed conflict, outside armed conflict, or in relation to the inter-state use of force” (p.2). More importantly, the different “jurisdictions” that the legal “frameworks” impose are heavily influenced by untested and undefined procedures governing the practice, the [*544] contractual arrangements between intelligence entities (such as the Central Intelligence Agency) or inter-state actors that are operating in a grey area of law, and the reality that executive decisions to employ the method are exercises of political power that largely escape judicial or public sanction (pp.2-8). In this sense one could imagine that Johns would observe that there is a host of non-legal forces at work that would more aptly explain the international legal machinations, or practices, underlying a regime’s decision to use chemical weapons on civilians or not, as it is suspected in Syria in that country’s civil war in 2012-13. In broad terms Johns’ methodology in presenting the case studies is described as “following a rich tradition of problematisation ‒ that is, of turning givens into questions ‒ within” international law and other scholarly disciplines (p.1). Specifically she opts for a “quasi-ethnographic” approach, one that works from the “premise” of an “open-ended and speculative course of constructing subjects by simultaneously constructing the discontinuous contexts in which they act and are acted upon” (p.22). In spite of this somewhat elusive characterization of her research methods, clearly she is interested in uncovering the myriad of non-legal practices, constitutive patterns of behavior, tactical choices, and contextual arrangements in the polity that orient, structure and frame international legal rules (pp.22-29). This “turn to practice” in seeking social knowledge, says Johns, is unconventional in international studies that often limit their understanding of international law as being an “instrument readily subordinated to rational will in the singular” (pp.23, 29) or unduly technical, specialized or fragmented (pp.14-21, 219). From the perspective of political science, Johns’ work, which is housed in the comparative legal academy, is highly reminiscent of what political scientists would do in adopting historical new institutionalism and constitutive principles to guide research inquires. The next four chapters present the cases studies and apply the principal heuristic devises as illustrations to demonstrate the nuances of non-legality that seem to escape typical understandings of international law scholarship. Chapter two centers on the release of the torture memos, an event that Johns argues forced scholars to confront the illegality of torture in legal terms. The scholarly response, she argues, is framed by a “restorative reconfiguration of illegalities” (p.59), namely a combination of four narratives about what it means legally to torture interrogation suspects or detainee victims. The four narratives consist of hope, correction, community, and conscience. In responding to the release of the memos, in other words, scholars generated legal understandings of torture by referencing the hope that the body of the law would return to its correct moral and democratic underpinnings (pp.49-51); that the errors made in drafting the memos can be corrected by an appreciation of the rule of law and objectivity (pp.51-53); that the legal memo architects will be held to account to the norms and obligations of the professional legal fraternity to which they are a part (pp.53-56); and, that recognizing the lawlessness of the memos will allow the conscience of the individuals and of the law to be restored, or saved, within the professional cadre [*545] (pp.56-60). Johns also posits that even the suspected (and abused) terrorist detainee became something akin to a “detainee-law maker” (p.63) through the release of the memos, for scholars witnessed in those pages the practices of legal reasoning adopted by both the abuser and victim in both documenting the violence and attempting to record it as a procedural matter through the disclosure of names and related evidence gathering, relative to what was done during interrogations (pp.60-66). Guantanamo Bay’s detention facility(GITMO) for suspected terrorists and “unlawful combatants” is the subject of chapter three’s argument that its “black hole” status renders it outside the law, or “extra-legal”, both in norm and practice (pp.69, 80). Johns taps into the recurrent theme that GITMO’s expulsion from the law is jurisdictional in nature, not indicative of being a transgression (like an illegality is), but rather occupying a space outside the law (p.69). Its extra-legal quality creates a paradox of sorts, allowing international law scholars and GITMO executive and military officials to use it to generate new legal frameworks, couched in terms of legal representation and classifications (p.70), which register its operation and practice through regularized bureaucratic procedures and patterns of behavior on a global scale. For Johns, prevailing critics in the international legal literature, as well as the exercise of power and discretion by American presidents and executive officials, have relied upon and reinforced GITMO’s extra-legality: whereas scholars argue new reform measures are needed (i.e. through institutionalized review procedures governing detainment) or that the doctrine of emergency explains why GITMO must be allowed to exist, perhaps in contradiction to humanitarian principles (pp.80-89), executives administering the law rhetorically marginalize their discretion by claiming that highly bureaucratized legal procedures over detention practices limit their powers and therefore follow democratic or legal norms (pp.89-105). Chapter four addresses non-legality’s effect on the decisions made by corporate lawyers negotiating and implementing “deals” (a conglomerate of contractual, pragmatic, economic, political, and regulatory arrangements) that comprise cross-border financing transactions (pp.111-112). As Johns explains, non-legality in this context consists of “an imaginative domain immediately preceding legal analysis (pre-legality) or opening in its aftermath (post-legality) in which the autonomous exercise of choice is understood to predominate” (p.109). Whereas international law scholarship has routinely discussed financing behavior in the conventional legal terms of respecting the autonomy, will or intent of contracting parties, Johns uses the legal-realist critique of that position to suggest that cross-border financing deals are a function of “freely negotiated, voluntary, contractual exchanges” (p.118) that are grounded in practical considerations (p.121). Presumably drawing off the author’s own professional role-playing experiences ‒ which amount to a quasi-ethnographic account of the “socio-political life of the deal” (p.135) derived from “haphazardly recorded notes from days spent as a corporate lawyer” (p.128) – Johns observes that transactional lawyering strikes an unpredictable balance between [*546] “what the law requires” and “what the market requires” (p.139). Doing so infuses behavioral patterns encompassing a wide range of deal-making pre-and post legal activities, including making legal judgments about choice of law and forum, the use of boilerplate language in document preparation, strategic timing, cost reduction, risk allocation, prior precedents and governing financial models, which are all juxtaposed against the prevailing norms and idiosyncrasies of the marketplace, the legal profession, and political or social milieus (pp.127-140). As she summarizes, in contrast to conventional legal thought: “Deal tempo, deal locales, and deal-contingent personalities … are among the patterns that inform and condition the ‘free’ exercise of choice to which legal work and lawyers contribute” in cross-border financing deals (p.136). With chapter five Johns investigates how supra-legality is conferred upon the work of the Intergovernmental Panel on Climate Change (IPCC), a highly influential intergovernmental advisory group in the policy area of global climate change, especially though the issuance of its Assessment Reports (pp.153-154). For Johns, “supra-legality” consists of “certain normatively significant practices [that] are so expansive or endemic as to surpass international law’s and lawyer’s grasp or engagement” (p.154). As such, supra-legality occurrences are situated at a “plane above or beyond the terrain of international legal scholarship”, except in very limited “fleeting” instances (pp.154, 168). In contrast to the social sciences, which have analyzed the IPCC’s work extensively in the literature, the international law discipline has narrowed its gaze to evaluating the IPCC’s work product in primarily three supra-legal, but limited, capacities: as a touchstone and catalyst for taking global action, either through policy-change legislation or litigation; as a dispositive source for amassing evidence about climate change and its global policy ramifications; or, as admixture of different scientific, epistemic, expert, and economic-risk communities that makes the IPCC uniquely situated to generate consensus about issues relating to global climate change (pp.168-181). Not seemingly satisfied with any of these international legal scholarship narratives (p.181), Johns fears that the extant literature will create a type of inertia that will paralyze the discipline’s ability to make new contributions in the field; yet, at the same time, she infers that recognizing this deficiency will allow future scholars to re-map the academic terrain (pp.182-184), a theme she returns to in the concluding chapter. Arguably the most captivating case study is found in chapter six, dealing with “infra-legal” international regulation of dead bodies in the aftermath of natural disasters. Using a widely adopted field manual for first responders authored by leading international health organizations as a main focus, the management practice and conditions “inferior to or underneath, but also within” (p.187) international action pertaining to the collection, identification, and disposal of disaster victims are chronicled. Inspired by the writings of Michel Foucault, these actions consist of government techniques and procedures relating to a sovereign’s security and power as it endeavors to manage corpses in the interests of governance (pp.193-196). Such [*547] techniques and procedures, for example, revolve around generating a stable circulation of data flow about who has died for identification and grieving purposes which, as well, helps to naturalize the mass death process as one occurring in the interest of life, especially in showing respect for local rites, customs, and traditions dealing with the “lawful management of the dead” (pp.197, 200, 203). In this way, “The living are equipped for survival in part by their expertly supported acquisition of knowledge of their dead” (p.202). For Johns, the narratives supplied by the infra-legal elements of the field manual ultimately help establish modern “repertoires” of “meaningful dying” (p. 209) that largely escape the attention of international law scholars. NON-LEGALITY IN INTERNATIONAL LAW remains a highly engaging, innovative, and sophisticated book that is worthy of serious consideration and debate in the legal and social science academies, but perhaps for different reasons. As the concluding chapter makes clear, the author’s goal is to expand the range of knowledge of international law scholarship by uncovering the “negative spaces” in international law: that is, to call attention to the “legal makings of the non-legal” (p.223). Not surprisingly whether Johns succeeds in that endeavor may depend upon the research orientation and the academic discipline to which the reader is attached. As the book is part of the Cambridge Studies in International and Comparative Law, the most likely receptive audience will be international or comparative professors or lawyers, perhaps confined to the legal academy. Those readers are more likely to appreciate the thoughtful and thorough treatment the author gives to the extant literature in light of the competing or alternative points of view detailed by Johns. Indeed, that in and of itself is a significant achievement, if one is to accept her version of the state of the international law discipline and her response to it, as well as her choice to rest her analysis on quasi-ethnographic research methodology. With the possible exception of those identified with the international or comparative sub-field, political scientists studying law and politics are less likely to be as engaged in the academic debate about whether conventional understandings of international law are missing the mark or not. What might stir their interest is the basic proposition that new international law and norms are created from non-law, as discovered through quasi-ethnographic methods. While Johns takes great pains to describe what that “quasi-ethnographic” means (p.22), it is a fair guess that many non-specialist law and courts scholars are either unfamiliar with the methodology or may be inclined to see it as more akin to taking a historical new institutionalism approach. For those so inclined what Johns has to say in uncovering non-legal origins or constitutive factors in international law might be more illuminating. Yet for some skeptics the idea that law is derived from non-legal sources or other factors is probably old hat, and what might make the difference in making the argument credible is whether there is empirical proof to back it up, typically (but not always) derived from attitudinal or strategic analyses using quantitative methods. Regardless, the book is important for [*548] another reason that Johns vaguely addresses but does not confront head-on as a theoretical matter. In positing that new legal norms are created from a variety of non-legal constitutive practices, NON-LEGALITY IN INTERNATIONAL LAW suggests that law is wholly indeterminate, a classic principle underlying legal realism. Her basic claim raises other jurisprudential questions as well. If norms are being created through indeterminate non-legal practices, then does that mean, as critical legal scholars might say, that there is no law, just politics? Are the types of norms being fashioned from non-legality emanating through higher or natural law sources, or the legal process, or economic and law theories? What exactly is the nexus between non-legality and so-called “law”, international or otherwise? Admittedly, those sorts of queries are not the focus of Johns work but they seem to be a logical extension of what the analysis might represent as a matter of legal theory, either as an academic or classroom contribution. For example, in addition to the case studies John presents, other scenarios in international law and the post-9/11 era are necessarily at the core of creating new norms and practices by legal practitioners, governmental officials, and sovereigns. Saying the norms and practices exist outside of law is one thing, but identifying what is driving those norms and practices in the global arena as a theoretical issue is another and assumes critical importance. To illustrate, what does non-legality mean as applied to international regulation of chemical weapons attacks (as alluded to earlier), or to the legality of National Security Agency surveillance in virtual realities, or to the criminal prosecution of suspected terrorists under the USA PATRIOT Act? While these issues are invariably the stuff of future research, it is worth considering if the tactical engagements Johns describes in international case studies fit comfortably or not with legal realism, law and economics, critical legal studies, or other alternative theories of law. While arguing the legal community is not looking in the right places to figure out what international law is or means is important, tying that literature to specific jurisprudential sources or influences might help us understand what that means to appreciate those “practices surrounding international legal norms’ unmaking by reference to something else” (p.222), especially if international law is truly derived from a “space” that is negative and not legal at all (p. 223). In short, an unwitting contribution of NON-LEGALITY IN INTERNATIONAL LAW is that it might impel scholars to use it as not only as a wake-up call, but also as analytical tool to discover how, as a matter of legal theory, what the nature of international law is itself ‒ and whether legal power in a post-9/11 era is being wielded in a way that is consistent with democratic norms, such as the rule of law, accountability, and justice. Undoubtedly Johns does this to some degree, but her focus is more on reminding scholars that there is more to the story than what the conventional view of international relations suggests. Little or no attention is spent on exploring abstract jurisprudential questions; or so it seems. In the last chapter she reiterates that her critique of prevailing international law scholarship originates from a “sense”, or a “series of intuitions” about international law and the direction it is taking in the legal [*549] academy (p.215) ‒ which in turn sounds very much like a realist speaking, but perhaps not in the way she intended. One could think that scholars may wish to determine if those sorts of intuitions are also at the bottom of explaining the kinds of “knowledge practices” (p.23) creating non-legality and, then, as a matter of legal theory assess the social, political, and economic ramifications on a global scale. 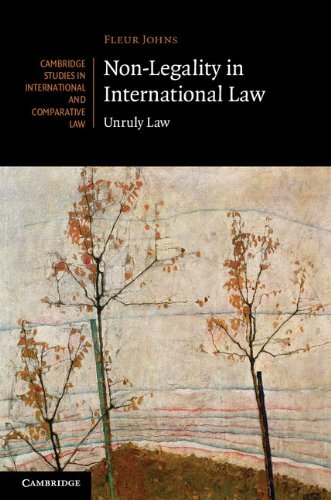 Regardless of whether the book is seen in that light or not, at a minimum, and certainly on the terms Johns defines, NON-LEGALITY IN INTERNATIONAL LAW is likely to inspire robust debate within the international and comparative academic community. Copyright 2013 by the Author, Christopher P. Banks.